Colbert's Chaplain on "Respect, Compassion, and Sensitivity"
Fr. 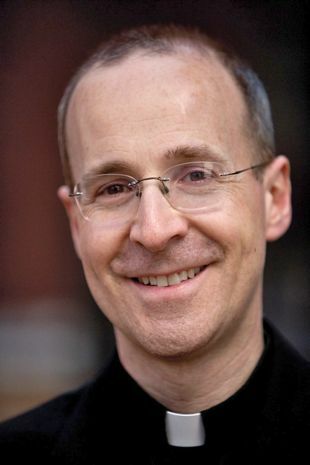 James Martin, SJ, is one of Catholicism’s leading spiritual writers and cultural commentators today, as well as one of the most sought-after Catholic conference speakers. Arguably, he has the largest “pulpit” for young people in this country since he is known as “Stephen Colbert’s chaplain,” appearing regularly as a guest on Comedy Central’s The Colbert Report. I’ve only offered highlights here. The entire posting is worth a thoughtful read. Too often, we only hear negative messages about LGBT people from church leaders and commentators. It’s refreshing and uplifting to read something positive from one of Catholicism’s most respected writers and commentators. Thank God for Fr. Martin! https://www.newwaysministry.org/wp-content/uploads/2017/09/logo_nwm-1.png 0 0 Francis DeBernardo, Editor https://www.newwaysministry.org/wp-content/uploads/2017/09/logo_nwm-1.png Francis DeBernardo, Editor2012-01-13 10:12:142018-07-09 10:28:41Colbert's Chaplain on "Respect, Compassion, and Sensitivity"
Well, I appreciate this, but unfortunately it is not enough. The statement that “this inclination which is objectively disordered”, needs to be changed. Gay people are gay because God made them that way and there are many different kinds of love. End of discussion. We are all to be accepted and respected for who we are. It’s not enought to say well we need to have compassion for these poor little disordered people. Even the best of comments tend to be slightly insulting and give the wrong message. I agree with Steve. Fr. Martin’s words are kind and enlightened. He does give a generous interpretation to the words of the catechism. Unfortunately Fr. Martin cannot and does not move beyond the vatican definition of gay and lesbian people as being defective heterosexuals. While tolerant and kind to individual gay and lesbian persons, Martin does not address the experience of gay and lesbian people who have grown to define their own experience and identity. Certainly he does not address the growing maturity of many gay and lesbian persons who have struggled to understand not only their orientation, but their relationships and even desire for formal recognition of those relationships, marriage. His words are welcome. More is still needed from those who have some standing and voice in the mainstream part of the church. couldn’t stop the execution but she could at least make it a little less of an onus. I sincerely appreciate Fr. Martins work to gain “acceptance” for GLBT persons. Being tolerated may be better than being persecuted…BUT, It is a not Respectful, Compassionate and Sensitive to label me as “objectively disordered” …and to deny me my truth… When will it be time to say “NOT TRUE” anytime anyone makes that erroneous statement. The scientific, medical and psychological professions have said, “NOT TRUE.” While crediting Fr Martin for his good works, I hope the New Ways Ministry will also say a loud resounding “NOT TRUE.” to “objectively disordered.